Sharif D. Rangnekar’s Straight to Normal is the autobiography of a gay man who is understanding what it means to be gay, and living in a pre-377 India. He spends almost thirty years of his life thinking, but perhaps not believing, that his attraction to men is a phase that will pass once he’s married and living with a woman – something he read in a book as a child and that stuck with him well into his adulthood. From the last summer he spent with his father before his death, and the difference between his brothers and himself, to being overweight, Rangnekar methodically narrates his childhood and himself through those years. He describes a chance encounter he had, where a young boy stroked his groin and ran away; and how it felt good instead of violating; how, on that same trip, he waxed himself and felt great. The first half of this book details a child who is a little lost, a little bit of a misfit, and entirely close to his mother. He shares the childhood stories and moments that have made a huge impact on him, being open about those defining moments that perhaps we all have. Around midway through the book, his engagement to a woman breaks up; soon after, he hears the name Ashok Row Kavi mentioned in passing at his office. After a lot of delay and contemplation, he finds the strength to call Kavi, who understands at once, and guides him to the Naz Foundation’s Humrahi programme meetings. This one phone call highlights two very important things; one, the importance of people from the LGBTQ+ community being openly out and helpful, someone that a person who is struggling can perhaps talk to or at least look up to. And two, right after the phone call, Rangnekar is surprised at the easy way Kavi speaks with him, recalling that for ‘Kavi, saying things plainly was normal… For him, I learnt, everything was normal’ (p. 80). This small thought speaks volumes about the state of mind of a person of the LGBTQ+ community who doesn’t know better. So many people think it’s okay to be ill-treated because of their sexuality; so many believe that it’s the way of the world to be disrespected, and seen as less than a full human being because of one’s sexuality, who would all benefit from even a single conversation and with a matter-of-fact tone of voice. And most importantly, this thought is testament to the far-reaching effects of even small kindnesses. After this call, Rangnekar’s life starts to change. His mind has been introduced to the concept of ‘homosexuality’ and has accepted it; he now has to go for his first Humrahi meeting. The next important thing the book speaks about is the weeks of struggle and anxiety about going to the meeting, something he really wants to do. His mind goes over every negative possibility, everything that could go wrong, everyone that might see him; he visits the place dozens of times, finds good parking spots, but doesn’t go inside. However, the important thing here is that he doesn’t just banish the thought from his mind and go on with life as if nothing had changed. He keeps the thought that he wants to go in his mind, keeps trying, and then one day, his eagerness and curiosity win over his discomfort. Four weeks after speaking with Kavi, he dons a bright blue shirt, tells his mother he’s going out for work, and heads to the meeting. He sits in his car before going in, with his head on the steering wheel, letting the fear wash over him. Then he gets up and goes inside. This first step into this world, into his community, was filled with uncertainly, confusion, and fear. It is for most people. Going into something and not knowing what one is going to find there is certainly one of the most vulnerable positions to put oneself in. However, like Rangnekar learns, there’s a lot of good to accepting who you are, to choosing to love yourself even amidst a world where hate sometimes seems to be winning. These meetings soon become a big part of his life; he makes friends, learns more about sexuality and what being gay means, has some strong advances made on him and secretly enjoys the attention. He learns of the differences in the community’s terminology, enjoys the witty banter, and has some relationships. He goes to parties, arranges meetings for the community, and helps in other ways as he can. Also, in this time, he comes out; first to his boss and his wife who are close friends, then to his mother who is surprisingly calm, to his brothers and their families – where of course there is the one person who goes ‘finally’ – and later to other family including an aunty who is trying to find him a woman to marry. Rangnekar details the hate, phobia and abuse faced by gay men, talking about one such incident of which he himself was the victim – and how he found the will to carry on with his life. He finds a haven in places like Bangkok and Phuket where he can be himself openly, and realises he is a rice queen. He starts a band, Friends of Linger, whose single “Head Held High” is a popular anthem for the Indian LGBTQ+ community. He slowly moves away from work and his career, towards activism – where he realizes that ‘we had to fight, and only then could we win’ (p. 201) – and writing and music, toward contemplation and social change. Also, he goes through the ups and downs of the Delhi High Court ruling, the SC’s repeal, and finally the Supreme Court’s historic judgement of 6September, 2018. Overall, the book flows fast and reads easily. It is the story of a complex life full of turns, laid out beautifully. 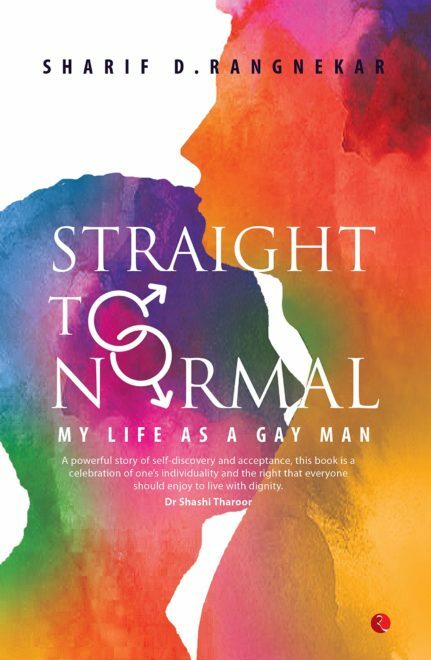 Sharif Rangnekar, above all, emerges as a brave person, living his life fully and honestly, and sharing that story so openly in Straight to Normal; as the title suggests, it is a story of growing into his gayness, and of first understanding and then educating people about its normalcy. This book is undoubtedly going to be a friend to many queer Indians for a long time, and like Rangnekar’s, every story is unique and important in its own right, should be shared, and will enthusiastically be heard. In a sentence: Rangnekar’s story, this book, is worth your time.